Notre Dame to be given 'Collaborator' status? 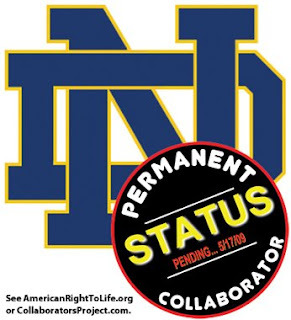 A pro-life group is warning that the University of Notre Dame may be given its "Collaborators" designation, a mark it reserves for those it considers the worst offenders in the war over abortion, because of its invitation to President Obama to speak at its commencement. Because Notre Dame has extended the extraordinary honor of speaking at one of America's foremost Catholic colleges to one with such cavalier disregard for the sanctity of life, social tension is increasing exponentially in your community. Collaborators Project was founded to do precisely that. Our motto is, "No Child Killing with Tranquility."